Based on its latest combat experiences, the Israel Defense Forces (IDF) is moving forward with the development and fielding of active protection systems (APS) for tanks and armored infantry fighting vehicles (AIFV). Both systems are utilizing destroying threats without ever having to initiate their warheads, at ranges that significantly reduce risk to dismounted infantry or collateral damage. The fact that the IDF and the Defense Research & development Directorate (DRDD) at the Ministry of Defense decided to support two parallel developments of two different APS technologies indicates the high priority Israel is providing to active defense systems – for tanks and armored vehicles – with the Trophy from Rafael Advanced defense Systems and Iron Fist from IMI; in air and missile defenses systems – such as Rafael’s Iron Dome and David Sling and IAI’s Arrow, and at sea, with the IAI Barak 8 missile system. The first is the Trophy, (also known as Aspro A), developed by Rafael. 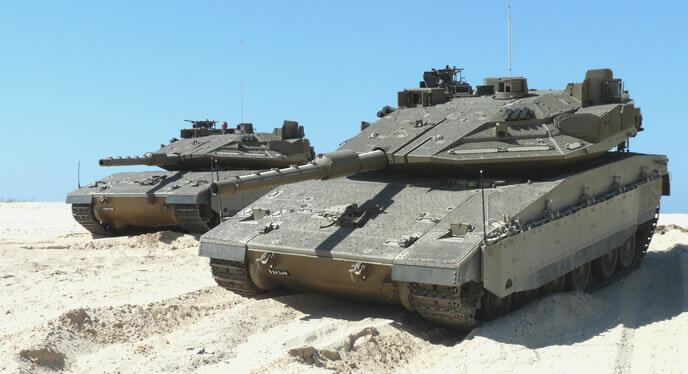 After extensive technical qualification and operational testing, the Trophy system was approved for production and became an integral part of the Merkava 4, it is now included in every tank rolling off the production line, making the Israeli tank the first Armored Fighting Vehicle in the world to field an operational APS as standard equipment. Rafael’s Trophy employs a network of four radar sensors covering a 360 hemisphere around the protected tank. The radar is integrated with the platform’s battle management system through the system’s processor, providing instantaneous detection of a threat immediately when firing a missile or projectile at the tank. Laser warning could precede the radar detection, if the tank is equipped with a Laser Detection System (LDS). However, while LDS commonly provide a warning as to the estimated quadrant of the threat, the Trophy radar provides an accurate solution enabling the crew to engage the firing source even when the they have launched missile is in the air, effectively suppressing the guidance or eliminating the threat altogether. Furthermore, using network centric connectivity, the location of the target can be transferred to other weapon systems for suppression, while the tank takes evasive actions. Only when the threat closes in to a certain distance from the tank, the ‘hard kill’ element of the Trophy kicks in. A close up view showing details of the Trophy APS components, including one of the the radar sensor, the hard-kill countermeasure mounted on its pointer pedestal, and blast deflector protecting personnel and equipment that could be exposed to the automatic system's blast effect. The deflector is necessary since the Trophy is initiated automatically upon the approach of an imminent threat. Photo: Israel MOD.. The kill mechanism used by the Trophy utilizes Multiple Explosively Formed Projectiles (MEFP). Mounted on an aimable pedestal, this module is pointed at the direction of the incoming threat and explodes, sending an ultra-fast sheath of melted fragments destroying the threat. 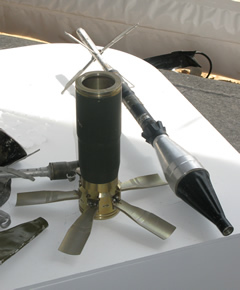 This hard-kill countermeasure is effective against all types of Anti-Tank Guided Missile (ATGM), Anti-Tank Rockets or High Explosive Anti-Tank (HEAT) projectiles. The APS is considered the only effective countermeasure against warheads containing tandem warheads, designed to penetrate reactive armor systems. Relying on a highly directional explosive for both propulsion and kill mechanism, the Trophy APS delivers response time and kill probability significantly higher than other systems. The Trophy system can simultaneously engage multiple threats arriving from different directions and is effective on stationary or moving platforms. Rafael is already developing follow-on versions for the Trophy. Future models will be able to engage a wider target set, including kinetic threats. Another evolution already in the pipeline is known as ‘Trophy 2’ – a more compact and lighter system, applicable to lighter vehicles including armored infantry fighting vehicles and armored personnel carriers. Trophy 2 follows the same principles of the the current system, optimized with the experience and know how gathered through the development of the first generation. Rafael has already conducted several successful firing tests with the system. Like the Merkava tanks rolling out of the assembly line fitted with APS, Israel’s Namer AIFV will soon be delivered with a different APS – the Iron Fist, developed by Israel Military Industries (IMI). Unlike the main battle tank, expected to operate in independent small units or in support of other elements, AIFVs like the Namer will operate closely with dismounted infantry, particularly in urban combat. Therefore, its APS has to address different safety requirements for this type of operation. The Iron-Fist has completed development and is undergoing integration with the vehicle and its systems and is scheduled to enter production soon. IMI has recently completed a series of demonstrations of the Iron-Fist for Israeli and foreign officials, as part of trials conducted for the Namer program. Realizing the growing demand for such capabilities, IMI embarked on cooperative development with leading defense manufacturers, launching marketing efforts to introduce the system to a number of new procurement and upgrading programs. Unlike the Merkava which absorbs the explosion of the MEFP brick on the side of the turret, the Iron Fist uses a mortar like interceptor tossing a projectile to engage the threat at a predetermined distance. This delivery method is considered faster and more responsive, compared to rocket propelled projectiles, optimized for intercepting targets farther down range. 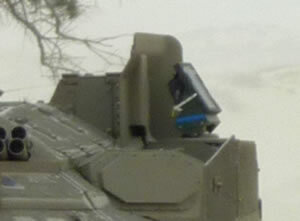 Like the Merkava tank the Namer will be equipped with two launchers mounted on each side of the vehicle. However, Iron Fist covers the protected hemisphere with two static sensors, rather than four flat panels used on the Merkava. IMI has designed the Iron Fist to operate a multi-layer protective system, comprising of situational awareness and early warning provided by radar and electro-optical sensors, soft kill elements utilizing an infrared jammer and hard kill. Iron Fist’s hard kill elements comprise of two twin-tube rotateable launchers employing fin-stabilized cylindrical shaped interceptors, built of a casing made of composite material filled with explosive charge. Shaping the blast’s shock wave provides an effective kill mechanism crushing ‘soft’ threats such as shaped charges or deflecting and destabilizing long-rod kinetic energy threats, significantly reducing their lethality and penetrating efficiency. The projectile is fully consumed by the blast leaving no hazardous fragments. Furthermore, the wavefront of the shock wave dissipates rapidly beyond the protected area, therefore, eliminating potential risk to nearby troops or non combatants. Like the Trophy, Iron-Fist provides situational awareness and integration with battle management and sensors and effector systems, and can handle multiple targets simultaneously, by employing the two launchers, in addition to soft kill countermeasures. Iron-Fist is part of IMI’s comprehensive, multi-layered survivability concept, ranging from signature reduction, situational awareness and counter-strike, soft and hard kill countermeasures to reactive and passive protection. Iron-Fist fulfils a number of these measures, comprising an advanced, all-weather sensor suite enabling target detection, classification and tracking by radar and infra-red cameras. The Sentinel radar was developed and optimized for the system by Rada Electronic Industries. The passive, electro-optical sensor array, produced by Elisra, operates in parallel to the radar identifying potential threats at combat ranges. 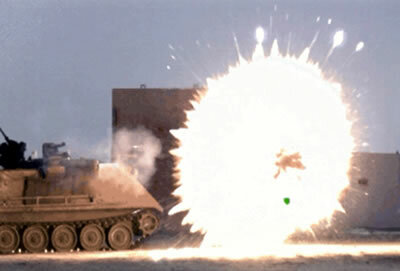 While ‘hard kill’ systems are being developed as part of Active Protection Systems (APS) countering threats of RPGs and anti-tank missiles, ‘soft kill’ countermeasures are also being considered, primarily against 2nd generation anti-tank missiles, where electro-optical (EO) jamming systems can be employed to defeat guided missiles, diverting them from their intended target. 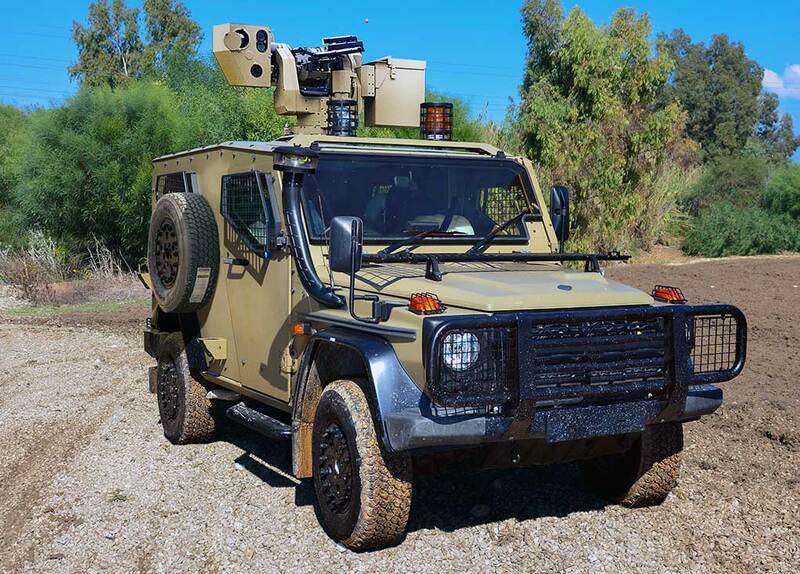 Certain types of anti-tank missile targets could be defeated by the system’s ‘soft kill’ two new VIRCM (Vehicle IR Countermeasure) systems, utilizing an advanced, solid-state, directional laser emitter developed by Ariel Photonics or the fiber-laser solutions developed by Elbit Systems for the MUSIC family of EO jammers. Both systems are displayed at the Israeli pavilion at the Eurosatory 2010 exhibition. Operating as part of a comprehensive multi-layered protection system, such systems operate contniuously or automatically enter the active-defense mode when detected targets are attributed as threatening the protected platform. When a specific threat is identified the system will first attempt to engaged second generation anti-tank missiles, by soft-kill, employing infra-red light sources to disrupt the command line, forcing the missile to divert from its course and miss its target. Elbit Systems offers its EoShield as a stand-alone system, that operates continuously, covering 360 degrees simultaneously (no moving parts are needed). The system operates automatically, without the need for any intervention of the platform’s crew. The EO Shield maintains a low profile and low signature, does not require connectivity to Missile Warning Systems (MWS) as it interfaces with the vehicle’s existing threat warning systems. The system contributes to increase the vehicle’s survivability by engaging certain targets at long range, thus eliminating the need for expendable hard-kill interceptors, which are usually available in short supply. Elbit Systems’ EoShield is a vehicular derivative of the Company’s airborne IR Countermeasure line of products, consisting of the MUSIC system, a multi-spectral infrared countermeasure that protects military aircraft and helicopters from shoulder-launched missiles. Elbit Systems has also developed the C-MUSIC system – a commercial derivative of the military MUSIC system, which was selected for use by Israel’s national carriers. Another mode of protection is evading detection and deception. At the Eurosatory 2010 exhibition IMI and Eltics are announcing the integration of Eltics’ Active Stealth and reactive technologies and the hybrid armor solutions from IMI, to introduce an ‘Invisible Reactive Armor Protection’ (IRAP). According to Rami Sokolower, IMI Marketing & Business Development manager for IMI’s Slavin division, IRAP modules will be developed, produced and marketed by IMI and Eltics, addressing the world market of medium and heavy armored combat vehicles, including main battle tanks, armored infantry carriers and Mine Protected Vehicles (MRAP, MPV). The IRAP will be provided as a medium weight solution, to be employed as part of the vehicle’s multi-layered survivability system. Does Israel Need Two Active Protection Systems? Is there a real justification for the IDF to field two different active protection systems in parallel? “The Rafael Trophy design, is more mature and is already operational, equipping tanks rolling out of our production line. The integration and maturation of this system took almost four years,” Brigadier general Yaron Livnat, Merkava Tank Program Manager (PM) told Defense Update, “we anticipate a similar process for Iron Fist. The two systems provide different defensive measures and at present, the latter system is in ‘pre integration’ phase, completing development and then proceeding to integration on the vehicle.” For actual fielding the system will require further formalities, IMI and Rafael are still competing on the supply of the Namer APS. IMI is offering a multi-layered system, that consists of several layers of defense, from the detection and location of threats, by electro-optical and radar sensors, through soft-kill countermeasures against guided missiles, to the use of ‘hard kill’ interceptors, against the incoming threats. Rafael plans to offer a scaled- down version of the Trophy known as ‘Trophy Light’, designed to match the specific requirements of the Namer. Can Israel support two parallel development programs? Successful exporting of these systems will determine the validity of these ambitious thrusts. 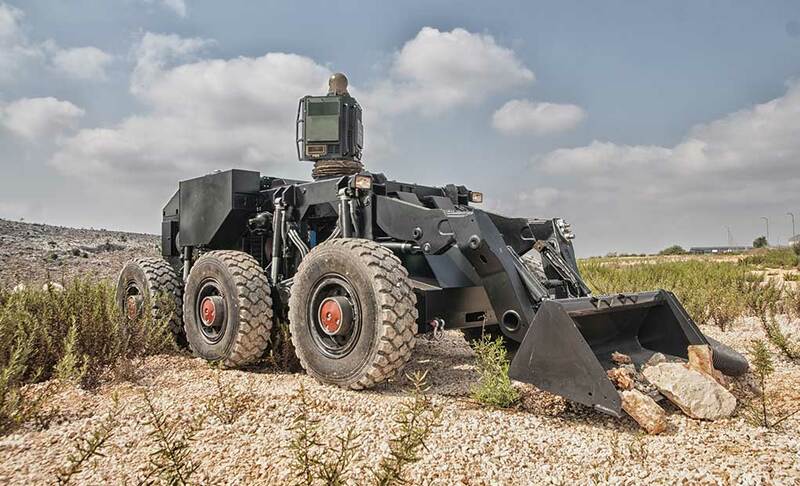 The Israeli MOD has realized the important role of exporting these technologies, and is actively assisting the two industries in exporting their APS systems, at the 2010 Eurosatory show and other international events. Previous articleThis Metal Piece Could Save Your Life!